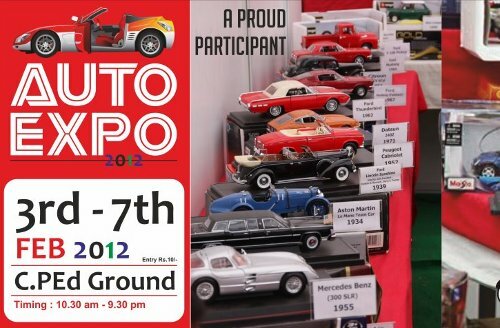 The Auto Expo 2012 will begin tomorrow (February 3) and will continue upto February 7, 2012 at the C.P.Ed grounds Club road Belgaum. This time the Auto Expo has been clubbed with Food festival and also a Consumer exhibition. This is the second auto expo being organised by Yash communications in the city. The expo will also host the National vendor development program in association with MSME and Belgaum small scale industries association to boost and develop small scale industries in the adjoining areas. The scale models of cars will be a added attraction at the expo where one would be able to see all their favorite all time cars in scale models. The organizers promise to get some new recently launched vehicles for display for the first time. Also the food festival also promises to have some great new taste for your taste buds. Visitors (on 2 wheelers) to this exhibition please wear helmets. great! whats the entry fees btw? Good to see that such events are happening Belgaum. But i still wonder Belgaum doesn’t have showrooms like HONDA, SKODA. People have to buy them from some other place. Great to see, Belgaum become lively.